The existence of live blogging could change the way I think about something that I am passionate about by the fact that I can experience the thing instantaneously second hand. Meaning, if I was too busy or unable to experience an event or pay attention to something, a live blog could help me catch up to what is going on. A semi recent example I can think about is the Summer Olympics. Despite it being summer and I did not have any classes, I was still very busy and was unable to catch any of what was going on. The five hour time difference from New Jersey, USA and London, Britain, did not help matters in anyway. Therefore, while I was working at my summer job, I had an internet tab open that gave me live-updates about the events that were taking place. It gave me scores, ratings, and placings of the athletes who just performed. Moreover, it gave updated standings as to what country won which medals. Furthermore, even with live blogging, it gave a different perspective to the events that I was unable to see. Since these live blogs had to be under a certain amount of characters, or that they had to be quick in updates so they get the information across while it is still relevant, it gave a different picture than actual live television or radio coverage of the events may have given. Live blogging possesses both positives and negatives, like much of anything in life. The positives I associate with live blogging can be turned to negatives depending on the way someone looks at it. Also depending on the extent someone may take live blogging and read live blogging to the extreme. Positives associated with live blogging: get quick updates, get a different point of view of events, additional commentary on something that you are passionate about is present, have a clue as to what is going on in the topic that is being live blogged, etc. Negatives associated with live blogging: not care to experience the thing being live blogged first hand, being to obsessed with finding out more and more about the thing being live blogged, becomes distracting if reading live blogging posts during school or work time, get misinformed about certain things because of inadequate amount of information, need to keep scrolling if there is a lot being talked about, get bored easily, etc. An example of a negative consequence during the Summer Olympics was how the place where I was working had its internet down because everyone kept on checking what was going in the events taking place. The people at the business were more involved with wanting to know what was happening than helping the customers that wanted to buy fabric (I was working at a textile company in New York City that summer). An example of a positive consequence during the Summer Olympics was how I was able to talk to other people who had actually seen the events on television about who won and participate in conversations that had to do with the important details because I had read live blogs about the events. In conclusion, live blogging to me is a two-sided coin that has both negatives and positives associated with it. However, it can’t be denied that it brings some interest in what is being live blogged, at least in the beginning anyway. I think that live blogging can be influential but it depends on what the topic is and it depends on how live blogging is being utilized. Music was used for the example; if someone was live blogging a concert or performance I wanted to go to, it would be their real life experience and it would be informative to me. If the atmosphere wasn’t fun or if the fans are rude and obnoxious, I would be able to know what someone live blogging about that. Likewise, if the artist wasn’t performing right or if they weren’t a good singer live, I would know. I think this is a pretty good summation of live blogging’s pros. The main point of live blogging is to show what is happening through your reactions. Live blogging at its core is informative. It may be colored with emotions or bias of a person but for the most part, you can somewhat tell what is going on. I think that live blogging something has the potential to change a perception but for the most part, it’s not really going to do anything. A smaller benefit would be that other people who are watching the same thing as you could point out something that you may have never seen otherwise. Many things from different events or movies have been pointed out in a live blog that, looking back, I wouldn’t have taken notice of. As for the cons of live blogging, I think that spoilers is the main thing. If someone is a live blogging a show that you haven’t gotten the chance to watch or even if your tv is a few seconds slower than theirs, you’re going to get surprises ruined. The same can be said for the previous example used; if an artist has a surprise ending for their concert and someone is live blogging that experience, you’re going to go to the concert expecting it and it’s going to lose its effect. On the other hand, if someone live blogs about that surprise ending and then it’s not there for the concert that you attend, it may leave you feeling disappointed and cheated. I personally find that I can’t go on Tumblr at all if I plan on watching something later than its airing date. I’ve gotten spoilers for the Grammy’s, episodes of shows that have been out for about 2 days, the Presidential debate, etc. A very real and more serious con of live blogging is the potential to give information to the wrong people. In the event of a school shooting, if the school is on lockdown and there are people outside watching the police activity and live blogging the event, the shooter inside (who would most likely have internet access) could potentially look up the event and see where police are to avoid immediate confrontation. They could plan a getaway or a strategic shootout. More often than not, school shootings tend to be led by people who don’t actually care what happens to them. If they know that the police are in a certain area, they may just avoid the area and continue with their actions elsewhere (obviously this depends on the school). Regardless of what is decided, it’s never a good thing to alert the enemy of the positions that the police have taken or their activities. For me, I view live blogging primarily through Twitter, and actually use Twitter to answer questions about events before turning to Google. Twitter is so frequently updated and there are so many users that chances are someone else has the same opinion or question about that crazy moment at the MTV Movie Awards. Since that award show happened last night, I will continue to use that as an example for the pros and cons of live blogging and the impact it has on me and my love for all award shows. I had a lot of homework to do last night, as did my roommates, and we decided that we would be too distracted if the show was on even just in the background, so I “watched” the show through Twitter and Instagram. As it is, I follow MTV and plenty of other celebrity news outlets on both Twitter and Instagram, so I actually didn’t have to put in much effort to know what was happening at each moment. Those publications, such as People Magazine and The E! News Channel, were live blogging the awards, constantly tweeting, posting pictures, and even posting and updating full articles on their websites. All I had to do to know what was going on at the show was to open the Twitter and Instagram Apps on my phone and I had the answer to who won what awards, who was being voted best dressed and why everyone was freaking out about Zac Efron. Thanks to Twitter, someone posted a video of Zac Efron’s shirt being ripped off by Rita Ora almost instantly after it happened so in reality I was only a few seconds behind on seeing that major moment. In this case, and as is the case with almost all award shows, I wasn’t worried about seeing spoilers about the show, because I was never actually going to sit down and watch the whole show afterward, nor do I like to not be in the know about these kinds of things. In addition, I prefer to follow live blogs of award shows. You get the best of the show — there’s the winners, the reactions, the clothing and the best moments — without the commercial breaks and annoying moments you don’t care to see. I also love being able to be a part of the community watching and talking about these awards shows, even if I’m nowhere near a TV. What are the positives of live blogging? – For starters, live blogs are getting 300% more views and 233% more visitors than conventional online articles on the same subject. They are getting more attention and are more popular for internet users and news lovers. – Greenslade also points out, that based on the study, live blogs provide commentary and analysis alongside breaking news rather than summarizing the event after it is over. Live blogs make news more interesting. People do not want just the straight facts of an event, that is boring. Adding in some commentary and analysis makes news articles more interesting for people to read. – This study also points out that readers prefer live blogs because they are more objective. It’s more conversational, and feels more real, not like a script people are reading off. – It is convenient! People are following a news story from beginning to end, on a single page without having to leave their computer screen. -Live updates are quick! The study found that publishing updates take every 20 minutes for six hours straight. – They are likely to include readers’ tweets as opposed to comments at the bottom. I think this is really smart. Social media is really popular, so to incorporate that into live blogging probably helps make live blogs more popular and like-able for readers. What are the negatives of live blogging? – One of the study conductors from City University, Dr. Neil Thurman, is quoted making the following statement on live blogging: “Live blogs provide this ‘news-at-work’ audience with what they’re looking for: regular follow-up information on breaking news in ‘bite-sized nuggets’ which they can read – as several readers told us – while they are supposed to be working.” The bit that made a point of live blogging being potentially negative was in the end of this statement, “while they are supposed to be working”. Since live blogs are more popular, are they distracting workers more than usual? Are live blogs blurring the lines between work and leisure? Potentially! – The fact that there are such quick updates leaves the chance for hasty, and not as thorough or detailed information. – Being on a computer screen can be bounding. You might not be reporting all the value you could be receiving from reporting on the spot. 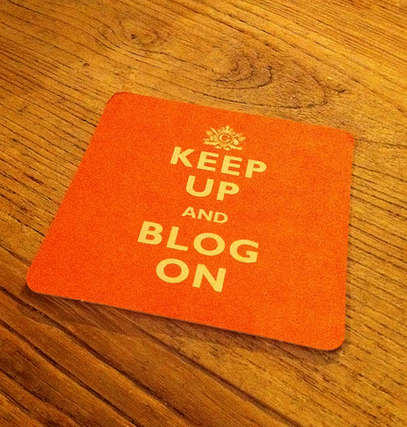 Based on this article and study, positives seem to out-weigh the negatives for live blogging! To me, personally, if I were a journalist I would invest my time in creating a live news blog. It seems like a great and fun way to report information, and to get your writing out there in a popular form of media. Or if I was someone who was super interested in live news, I would definitely follow a live blog. Live blogging looks to be great advancement in media, so if you intend to participate make sure to keep up and blog on!